Welcome to XERA: Survival's final Open Alpha! The alpha will run from 19th - 23rd of April. GET YOUR KEY: Join our Discord and type !key in the #request-key channel. NOTE: We have a limited amount of keys, first-in, first-served. Do my friends have to pay to participate in the Invitational Open Alpha? No, participation in the Invitational Open Alpha is free provided they are allocated a key. In the event we run out of keys and cannot obtain more, then the only way to participate will be via pre-order, but we (currently) have plenty of keys for the Invitational Open Alpha. I am a member of the XERA: Survival community but I’ve not yet pre-ordered or played the game – can I participate in the Invitational Open Alpha? You sure can. 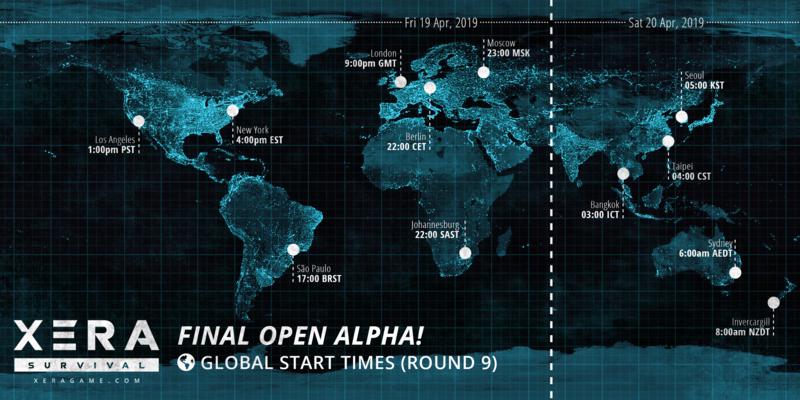 Just head to the Invitational Open Alpha registration page at https://xeragame.com/alpha-signup and sign up. Hang on – I’m a Backer and now people are getting to play for free?! The keys being used for the Invitational Open Alpha are for that purpose only and will not work once the game enters Early Access. We may make a decision to allow these keys to be used in an Open Beta prior to Early Access release, but this is not yet decided. Are there any limits on the number of people I can invite? In practice, no, but please don’t invite large numbers or spam groups with invitations. We will monitor invitations and reserve the right not to allocate keys if we feel the invitations have been abused. Please only invite your friends who you think will enjoy the game and have the time to play it on the Invitational Open Alpha weekends. How are you going to allocate the keys if there are only a limited number? Just before the Invitational Open Alpha weekends, we will allocate keys and email them out. In the event we run out, we’ll order by the date of sign-up. If we get additional keys further down the line, we will also try to backfill if people missed out. Will these keys work for future pre-release testing? Very possibly – this decision has not yet been made. Can I stream / take video / screenshots / make GIFs? Yes! Please send us the links so we can give back to you folks for the support you’re showing us! If you are a regular content creator, be sure to check out our Creator Program. Will these Invitational Open Alpha keys work once the game goes into Early Access? They will not, no – that would not be fair on the Backers who have pre-ordered the game. We hope if you folks like it, you’ll want to join the pre-order program too. There will be other benefits for Alpha participants to be revealed further down the line, but these will not be discounts on the pre-order price. Yes! I'd like to join the list to receive a token for the XERA: Survival Invitational Open Alpha! If you are a content creator, you may be eligible for our Creator Program. You are signing up for Round 9 which starts on the 19th of April. COPYRIGHT © 2018 - 2019 SPOTTED KIWI INTERACTIVE LTD.